This Speer Gold Dot ammunition takes the compact .380 ACP cartridge to the next level, making it the perfect carry load for a Ruger LCP, Sig P238, or Walther PP. 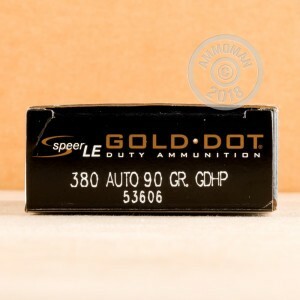 Designed around a 90 grain version of Speer's Gold Dot bonded core hollow point bullet, this cartridge achieves a muzzle velocity of 990 feet per second and delivers above-average penetration and expansion in the .380 category. 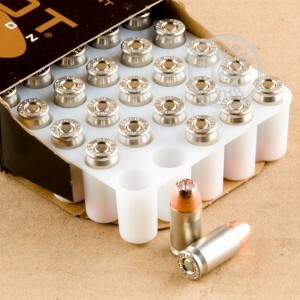 Gold Dot ammunition is loaded with top quality components including non-corrosive Boxer primers from Speer's sister company CCI and nickel-plated brass cases that will withstand long periods of daily carry. 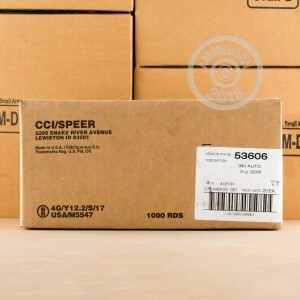 To get some serious training done, grab this 1,000 round case of Gold Dots and save with AmmoMan.com's free shipping promotion!